Don't be left in the dark with the Emergency SOS Key Chain Light from 5ive Star Gear. 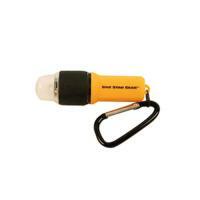 Small enough to fit on an ordinary key ring, or attached to apparel and gear using its carabiner clip, ensure the compact light is extremely portable. The .75-Watt LED bulb is highly energy-efficient and long-lasting, with a maximum lifetime of up to 80,000 hours. The light includes two settings, a constant beam for illumination and an emergency flashing SOS signal for attracting attention. The light runs off a single AAA battery.